It was a long trip to Vancouver but it was a good one. After a six hour drive, a happy reunion with our intern Marie, who went on a family vacation for a few weeks, and a restful sleep, we were ready for an exciting day of learning new things about equine first aid, an integral piece of knowledge for a horseback riding guide. If anything happens whilst you are out in the mountains, as the horseback riding guide you are responsible for looking after your horse before help arrives. Hanna, Marie and David taking the vital signs. Theresa, our teacher for the day, welcomed us with a delicious breakfast at her small farm in the countryside of Vancouver. Besides the six of us, three more people took part in the course. The first part started with an interesting presentation about general behaviour and signs of horses. We talked about past experiences we made with sick or injured horses that we had learned since starting horseback riding guide training and Theresa gave us a lot of valuable input by summing up some of her past challenging situations. 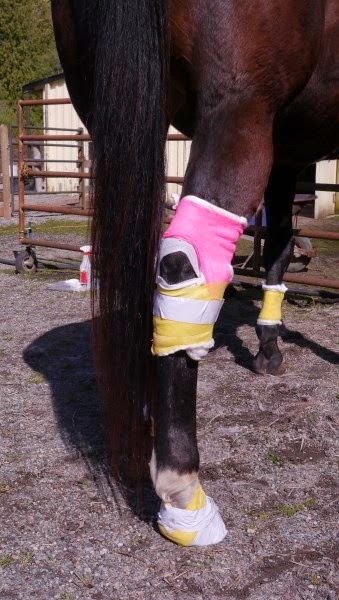 One thing that became evident from this was that: if your horse gets injured or sick, most of the times the best solution is the most creative and resourceful one! After two hours of theoretical learning we went outside and started to practice on Theresa’s extremely patient horse Dixie the things that we had discussed earlier. We tried out everything beginning with checking the horse from its ears to its tail by taking all the vital signs like the heartbeat, measuring the body temperature and looking for any signs of dehydration. Everyone got the chance to give it a try and everybody would agree that finding and hearing the horse’s heart beat was the biggest challenge! Training how to bandage a horse leg. Afterwards we learned how to stretch a horse to make it feel comfortable every day. Theresa showed us a number of different exercises and before we went back inside for a lunch break we practised our horse stretching skills. Even if it feels a bit strange at the beginning to pull on the horse’s tail or checking the spine with a hoof pick for any tension, everyone got comfortable with it extremely fast. The second part of the course in the afternoon gave us a lot of new knowledge about how to handle horse injuries if no vet is around and how to analyze symptoms and react in critical situations. All this information gave us a lot of certainty and confidence in preparation for any upcoming situations as horseback riding guides. But as we know: theoretically knowing how to do something is one thing but actually doing it is usually a lot more challenging! And so we went outside again and practised in small groups on different horses. Each group got nine different simulated situations of injures or difficulties and had to find fitting solutions for them. So everyone got the chance to bandage different parts of the horse and to check its vital signs. It was a lot of fun and we should be grateful to the horses who worked as patient models. Alina and Lina finding a way to bandage the injury. In the final part of the course we got a demonstration of a perfectly equipped first aid kit and some unusual but extremely helpful tools. The course finished in the late afternoon and we left the farm with numerous bags of new useful knowledge and interesting information about equine first aid, and we all felt more prepared to be horseback riding guide people.